So funny that yesterday I posted about a Clothesline style frame, and today I'm posting about a craft that uses actually clothesline. It was totally random! I also went round and round in circles trying to figure out if the cord or rope you use for a clothesline is spelled "Clothes Line" or “Clothesline” and I couldn’t find a definitive answer… hence I will be using ‘clothesline’ for this entire post. 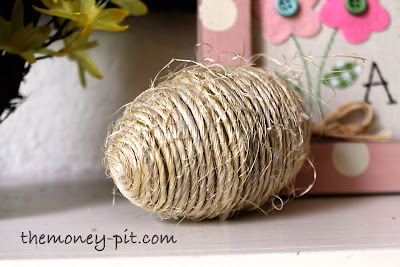 Only I had learned with my twine wrapped eggs, that the finer the twine, the more likely you are to burn your finger tips off on the molten lava that is known as hot glue. The clothes line was nice and thick, and so I knew it wouldn’t be too bad. 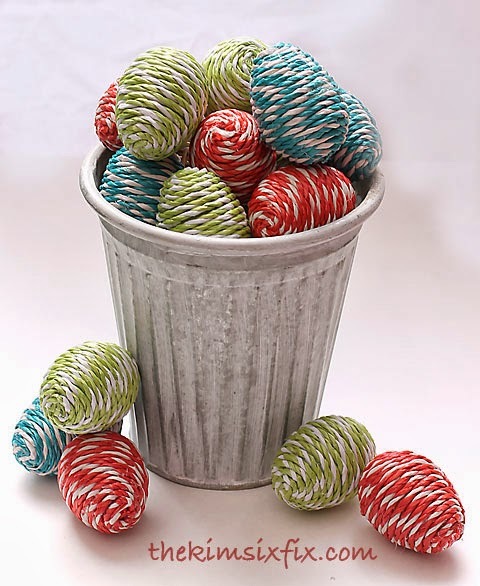 Now I just have to figure out where to incorporate them into my Easter decorations this year. Linking up to MyRepurposedLife, HomestoriesAtoZ and a few of THESE parties. Visiting from Show & Tell Wed, these eggs are so cute. I may have to give this project a try. I'm in need of some eggs for my spring wreath. These are too cute! Great idea! Perfect for Spring!